Estate Planning Self Examination Checkup Chapter IV - Selecting Fiduciaries - Davison, Eastman, Muñoz, Lederman & Paone, P.A. 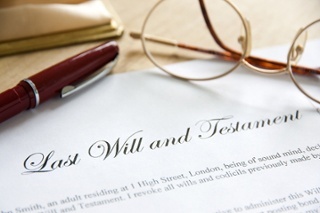 In a will, one must appoint the people who are charged with carrying out the intentions of the testator. The people you select should be dependable and understand their roles. These people are called “fiduciaries.” The fiduciaries include the executor, the trustee and a guardian. The executor is the person who carries out or executes the instructions of the will. The executor should be an individual you trust. You may also have one or more executors. Most people choose their spouse, an adult child, a relative or friend or even a corporate trust company. In addition to an executor you should have a backup or contingent executor. We suggest the person you choose be capable of making the decisions necessary to settle the business affairs of your estate. You should discuss the duties and responsibilities with any individual(s)you intend to appoint so you are assured they understand what is expected of them. When reviewing these issues with the potential executor, one must be sure that the executor is capable of carrying out the will of the testator even if they disagree. An elderly testator should select at least one executor who is in a younger generation in case the first selection should die before the testator. This is also true in the selection of other fiduciaries. A trustee may be charged with carrying on the business of a trust long after the testator’s death. With respect to guardians, the opposite is true. The guardian selected should be at least in the same generation as the testator. Often times, individuals with young children will select their parents who may not survive until the children reach the age of majority. We usually provide that the executor appointed serves without the obligation of posting a bond. The purpose of the bond would be to assure that the executor honestly carries out their duties. The bond would be an extra expense for the estate. The law still holds the executor liable for dishonest or improper acts. Yet by selecting a trusted executor and waiving the requirement of posting a bond in the will, the estate can save significant dollars. The trustee and executor are also entitled to commissions for performing their jobs. No additional stipend need to be set forth within the will. The trustee you select may play a major role in seeing that any trust established in the will is administered smoothly and in accordance with your instruction. The trustee is one of two, or potentially three, fiduciaries appointed under your will. The trustee’s task is to follow the trust provisions and exercise discretion when appropriate. The role of the trustee is not simply as an investment manager. The trustee can and should hire a professional investment manager when making decisions generally about a trust and its administration. You may want to consider naming more than one trustee or a corporate trustee. For the most part we recommend a trusted family member or friend who understands your personal situation, your goals and the beneficiaries. Another important issue covered by the will is the selection of a guardian. If you or your spouse dies while your children are still minors, which in New Jersey and most states is under the age of 18, you will want to make sure that they have the best possible care and guidance. The selection of the guardian is the most important part of your will even if you have no assets. Someone, even the State, will pay for your children, but who they ultimately become is most likely shaped by who is selected as the guardian. Thus, the selection of the guardian should be done with great care and consideration. The appointment of the guardian under your will gives you the opportunity to select the person you believe can provide the care, guidance and nurturing your child may need. The guardian need not provide funds for your child as that would be provided by your trustee from any trust that you have provided for your children. Before naming a guardian, you should talk to the person you would like to name to be sure they are willing to assume the responsibilities. If you have several children, you must make sure the potential guardian is up to the task of a significant expansion of their household. If, during your annual review, you have determined that the person you selected as the guardian is no longer capable of providing the care for your child that you require, then selecting a new guardian would be an important reason for changing your will or executing a codicil. Often times people select individuals while their children are very young; subsequently these guardians may be incapable of carrying out the position as the children get older. Who you select may depend upon the age of your children as well as the guardian’s lifestyle and attitude. We also suggest that you name an alternate guardian who can take over if the primary guardian is unable or unwilling to fulfill the responsibilities. If you do not name a guardian to care for your children a judge will appoint one for you. It may not be the same person you would have chosen and may be the result of litigation between various people seeking to obtain guardianship over your children. While it is legal to name a couple as co-guardians, we advise that one person be selected at a time. The possibility that a couple may choose to separate at a later date may result in your children being involved in their custody battle. Again the potential exists for a judge to determine who raises your children. This has been another of the installments setting forth what we remind clients to look for when performing their estate planning self-examination checkup. In subsequent installments we will touch on the details of specific trusts, gift giving, business succession, retirement asset planning, special needs trusts, powers of attorney, living wills and health care proxies.